As battle commenced for the final Act of the Extreme Sailing Series™ in Los Cabos, presented by SAP, the protagonists in the fight for the 2017 title dominated the podium. Oman Air was the clear leader, finishing seven points clear in pole position. 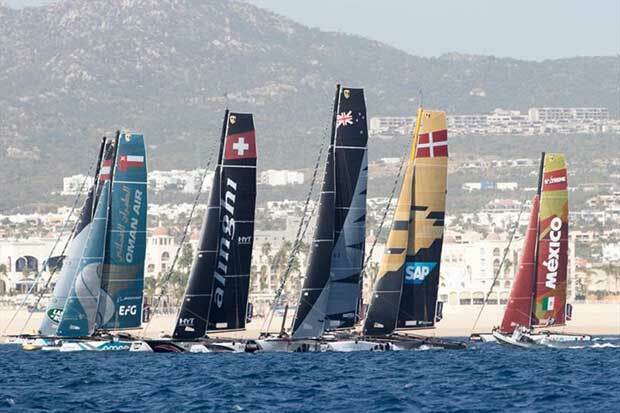 SAP Extreme Sailing Team, the current season front-runner, was forced to settle for third behind 2016 champion Alinghi as the Series made its debut in the Mexican venue with perfect foiling conditions. “It was a really good day,” said Phil Robertson, skipper of Oman Air. “We worked very hard and the boys were really determined, so there was a lot of focus in our eyes. It all fell into place for us with top twos in every race, and that’s exactly where we want to be. “This is just day one of a long event. We always knew this was going to be the breezy day and an important day. We wanted to make sure we cemented a good spot on the leader board and got some points in the bag and we managed to do that, so it’s satisfying. “What happens behind us happens behind us and we’ve only got eyes looking forward,” added the Kiwi skipper. 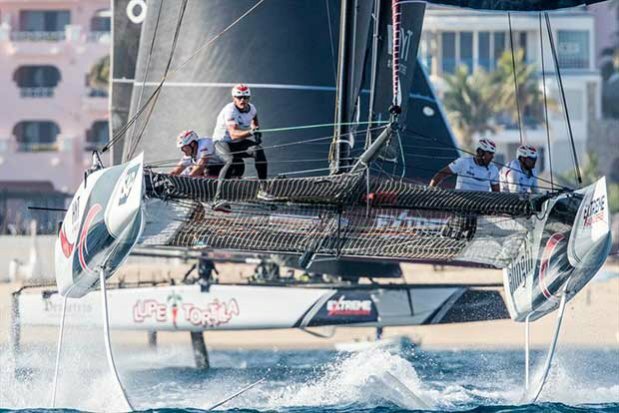 In order to claim the 2017 championship, both Oman Air and Swiss-flagged Alinghi must put at least two boats between themselves and SAP Extreme Sailing Team, as well as finishing ahead of the other. Both took advantage of the six races on the opening day to do what they could to keep the competition wide open. “It was a great day on the water with some really good conditions. Everything went well and I think we made the right moves,” said Arnaud Psarofaghis, co-skipper of Alinghi. “We saw Oman Air and SAP Extreme Sailing Team doing really well today. We need to keep pushing so we can sail with them. We need to be in the right spots at the right time and, with a little bit of luck, we could be in with a chance,” he added. Although not ahead in the standings, SAP Extreme Sailing Team managed to break the speed record of the season with 33.7 knots. Helm Adam Minoprio is not deterred by the result. NZ Extreme Sailing Team hit the ground running, winning the opening race and ending the day in fourth, while Land Rover BAR Academy finished on a high with a bullet in the closing race. The British squad, helmed by Olympic gold medallist and America’s Cup sailor Giles Scott, took fifth, ahead of Red Bull Sailing Team in sixth. Local wildcard Team Extreme México put in a respectable performance on home waters, finishing ahead of US-flagged wildcard Lupe Tortilla Demetrio, who competed for the first time at Act 7 in San Diego. “I think overall it was a great day. It was our third day on the boat and the first day we really got to foil, so at the beginning we felt we were just setting everything up,” said Mexican skipper Erik Brockmann. “It’s obviously tough against this high standard of competition but we’re happy. We just wanted to get out there, get around the course and get in amongst the fight. We’re ready for tomorrow,” he added. The double-points finale resumes at 14:00 UTC-7 tomorrow, Friday 1 December. The free-to-enter public Race Village, located on Médano Beach, is open from 10:00 local time. More information about the event, and the VIP packages that are available, can be found on the official event page. Fans can follow tomorrow’s racing remotely via the live blog. The action will be streamed live on Saturday 2 December and Sunday 3 December on the official Facebook and YouTube from 14:00 – 17:00 UTC-7. The experienced team showed they were the boat to beat as their high-speed foiling catamaran reeled off a succession of first and second places at the start of a four-day title deciding Act in Los Cabos. After six races Oman Air topped the leaderboard ahead of defending 2016 Extreme Sailing Series champions Alinghi and overall season leaders SAP Extreme Sailing Team, in second and third place respectively, as the only team among the eight present not to record a finish off the podium. The Phil Robertson skippered Oman Air crew of Pete Greenhalgh, Nasser Al Mashari, Ed Smyth and James Wierzbowski went into the 2017 decider in second place overall, five points adrift of the Danish-flagged SAP team and a single point ahead of the Swiss Alinghi crew. The team shrugged off a highly untypical fourth place finish at the previous Act in San Diego, fully aware that the unique double-points scoring on offer in Los Cabos could give them a final shot at the title. “It was a really good sailing day on the water and we had a great day – we broke a jib sheet which may have cost us another race win, but otherwise we had an amazing day,” said an exuberant Greenhalgh, Oman Air’s veteran tactician and mainsail trimmer. At the end of a day which saw 17 knot gusts with 30 degree shifts in wind direction, Oman Air finished on 67 points, a full seven ahead of Alinghi, with SAP on 58 points after coming last in the final race. Aside from the leading trio, both NZ Extreme Sailing Team and Land Rover BAR Academy took a race win apiece to keep alive the chance of a last-gasp upset as the season draws to a close. With less wind forecast on Friday there is a chance racing could be moved further offshore, where bigger waves offer the prospect of additional thrills for the Extreme Sailing Series fleet. Racing continues until Sunday.